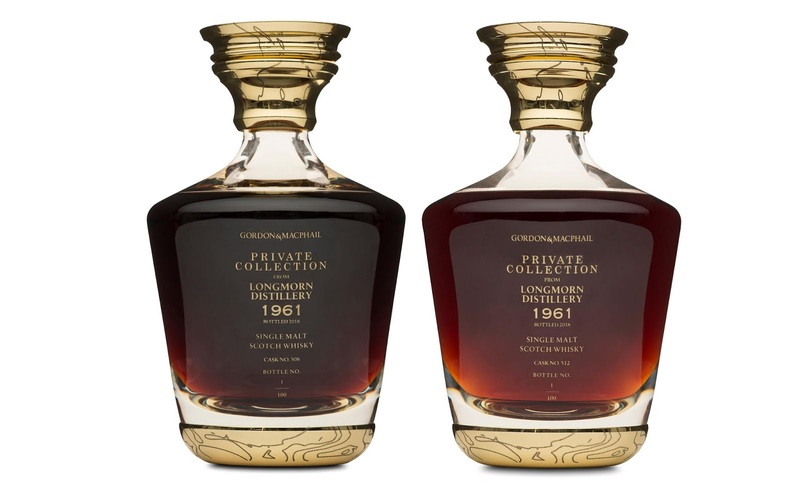 Leading whisky specialist Gordon & MacPhail, has today announced the launch of the oldest Longmorn single malts ever released, as part of a special limited-edition twin decanter set. The Private Collection from Longmorn Distillery Twin Decanters, were selected for bottling by identical twin brothers Stuart and Richard Urquhart, from stock originally laid down to mature by their grandfather George Urquhart in 1961. Both of the whiskies from the Speyside based distillery, were matured in first fill Sherry hogsheads and bottled at cask strength. Richard Urquhart’s whisky from the European Oak Cask 508 was bottled at 45% ABV, while the whisky from American Oak Cask 512, selected by Stuart Urquhart, was bottled at 40.8% ABV. Each individually numbered hand-blown decanter of Longmorn, comes with a book written by renowned writer and rare whisky specialist, Jonny McCormick, along with a personally signed certificate of authenticity from each brother. Limited to just 97 sets, the Private Collection from Longmorn Distillery Twin Decanters, will be available later this month from specially selected specialist retailers, for a RRP of £30,000.